The Laramie Longhorn range represents Ram’s upmarket offerings, yet the truck maker has revealed its plans to take things to a new level. Introducing the Laramie Longhorn Southfork at the State Fair of Texas today, the latest member of Ram’s ever-growing truck family, adds more luxury, technology and refinement to the range-topping Longhorn trim. The sole distinguishing exterior upgrade is a stretched “Longhorn” badge finished in bright chrome, stretched across the tailgate, as the upgrades are primarily focused inside the truck. New Canyon Brown and Light Frost Beige leather seats are joined by leather-wrapped grab handles, a Walnut-trimmed steering wheel, and Light Greystone suede headliner and visors. A more upscale trim includes walnut-colored real ash wood accents and Ruby Red stitching, while the truck also features Ram’s Uconnect 4C 8.4-inch touchscreen including navigation, 4G WiFi capability, Apple Car Play and Google Android Auto, rounds off the upgrades. “Along with increased capability, technology and efficiency, Ram is constantly looking for ways to create more comfort and refinement for our customers. The new Laramie Longhorn Southfork edition is another example on how we deliver the most luxurious pickups in the industry,” said Mike Manley, Head of Jeep & Ram. Ram also introduced a new Heavy Duty Lone Star Silver edition, available on the Ram 2500 and 3500 4x2 and 4x4 Crew Cab with either the 5.7-liter HEMI V8, 6.4-liter HEMI V8 or 6.7-liter Cummins boasting a class-leading 930 lb-ft of torque. The new edition adds a new grille with chrome surrounds and wave mesh inserts, new bright belt moldings, chrome side view mirrors, side steps and polished 20-inch wheels and front tow hooks. An aluminum Lone Star badge mounted on the grille identifies the truck as the Silver edition. Inside, the cabin benefits from cloth and vinyl high-back bucket seats in either Canyon Brown and Light Frost Beige or Black and Diesel Gray. 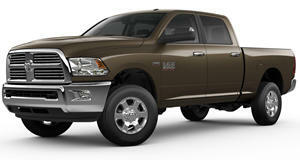 The Laramie Longhorn Southfork edition is available on Ram 1500/2500/3500 4x2 and 4x4 Crew Cab, Mega Cab, long or short box. 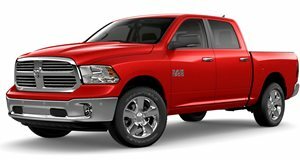 Prices for the Laramie Longhorn Southfork will start from $51,220 for the Ram 1500, while Ram 2500 Heavy Duty models will start from $55,620. 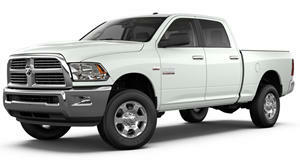 The Ram Heavy Duty Lone Star Silver edition comes priced from $44,735.